Hooking Up Gets Easier To Do In Saudi Arabia : Parallels These days, some young people in the conservative kingdom also use Tinder to find a match. 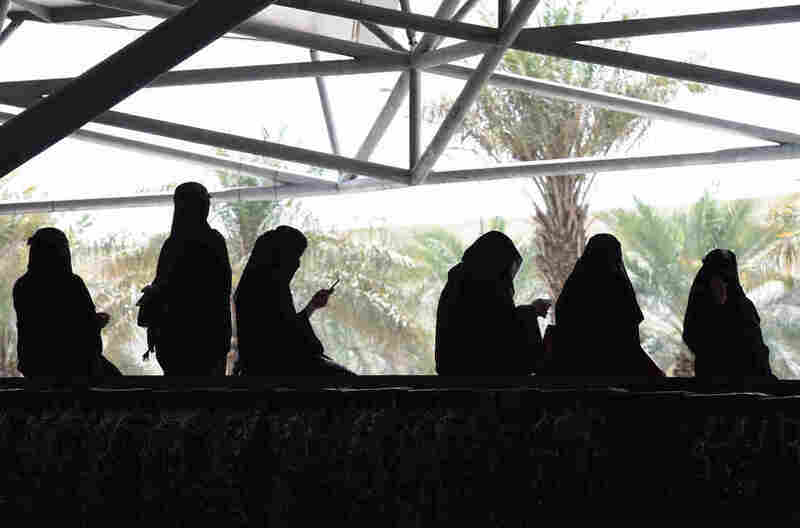 Saudi women wait for their drivers outside a hotel in the Saudi capital Riyadh. The White Foam Cafe in Riyadh is a cheery little place with wooden tables and chairs, and a good reputation for its fair-trade coffees and vegan desserts. It's also well-known for something else. "This is one of the really famous dating places here. I dated my fiancé a lot here," says a 29-year-old woman enjoying a French-press coffee. She's wearing stylish high-heeled shoes and a black abaya, a traditional floor-length cloak. But her flowing hair is not covered. She asks NPR not to use her name for fear her family would find out about her dating past. Until recently, she says, it was "taboo to be seen with a man who was not your relative." Nowadays, things are getting easier for many Saudis on the heterosexual dating front. The Gulf kingdom now allows things like movies, music and theater that it once forbade. More men and women are openly mixing in public than before. Though some in the deeply conservative country are bothered by it, a growing hookup culture is one of the latest signs of gradual social change. It's not that Saudis never used to date. They just had to be careful and devise ways to meet. A man would write his phone number on a piece of paper and drop it on the ground near a woman he was interested in. Or sometimes men would pull their car up next to a vehicle with a woman in it, and ask her to open the window, says the woman in the café. "If you don't open, they would go to the driver and fight with him until they force you to take the number," she says, shaking her head at the memory. "What the hell, you expect me to call you?" she laughs. These days, some women are even becoming more assertive in the process, says the woman, a government worker, who will begin a Ph.D. in the fall. "I've seen girls who are pro-active and if they like a guy, they would go to him, and that's happening a lot right now," she says. "Girls are becoming more powerful — I love it." Others are unsettled by it, like one young man who spoke to NPR in a different area of Riyadh. He also doesn't want to use his name, saying his family would be angry with him for talking to foreign media. "You know I'm sort of weirded out that girls are more active in pursuing men than men are," he says. "I've been catcalled, believe it or not." The 26-year-old man is wearing a thobe, a long white gown. He says he's a traditionalist and has never had a girlfriend. He feels he has one foot in the past, another in the present. His mother wants to find him a young wife, while his friends call him old-fashioned. "They say, 'you look decent ... you come from a well-established family ... why aren't you putting yourself out there?'" he says. Women are encouraging him to date, he adds — he never believed that would happen in Riyadh, a famously conservative city. The dating scene is more relaxed in the western port city of Jeddah. The city has a vibrant arts and culture community, and it feels more laid-back than the capital. Young people will stroll along the corniche at day's end, watching waves roll in from the Red Sea. Khulood, a 23-year-old filmmaker, is active on the dating scene. She asked NPR not to use her last name, in case her parents find out. "You can't tell your parents that you're dating someone," she says. "So always keep it a secret." Although she acknowledges it is fine to tell her friends. Khulood says she used Tinder, a mobile app for hooking up. Instead of a photo of herself, she used a picture she painted for her bio image. She's now dating someone she met on Tinder and has taken down her profile. Deema Najim, a 21-year-old student and budding filmmaker, says she is in no rush to start dating. Even if she was, she's adamant she wouldn't use Tinder. "Hell, no, no, no, no!" she says. Najim says she doesn't want to offend anyone, but doesn't have high regard for the men using the app. "Most of them are players. If I'm going to date, I'm going to seek out someone who is serious," she says. Najim says she doesn't want to get attached to someone and it doesn't go anywhere. It may be more acceptable now, but dating in Saudi Arabia can be just as confounding and complicated as anywhere else in the world.